In the United States, 26 million adults are living with chronic kidney disease, and many others have a high risk of developing this disorder. For most people regular exercise can safely reduce the risk of developing conditions that cause kidney disease, such as type 2 diabetes, high blood pressure and heart disease. Exercise can even benefit those who are already experiencing compromised kidney function. Kidneys filter the body’s blood, extracting toxins and chemicals that the body won't use, expelling these waste products as urine. The kidneys reabsorb substances the body can use, such as water and amino acids. The kidneys also keep levels of sodium, potassium and other ions in the blood balanced, secrete hormones that help regulate blood pressure and calcium levels, and maintain a pH balance in the blood. Whether you simply wish to maintain the health of your kidneys, or you have kidney disease and want a way to improve your general health, incorporating exercise into your weekly routine can help. 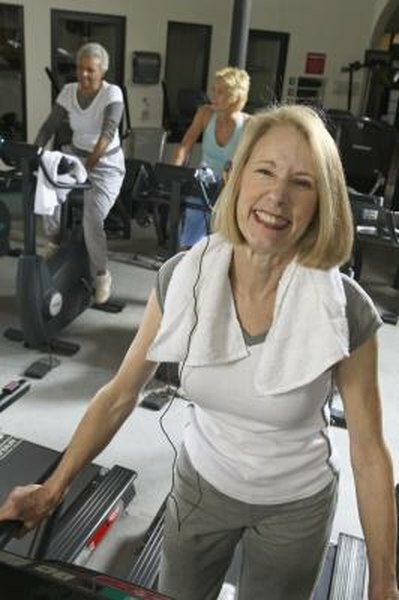 According to the National Kidney Foundation, “Exercise helps kidney disease by improving muscle function, lowering blood pressure, lowering cholesterol, keeping a healthy body weight and improving your sleep.” In addition, dialysis patients who exercise experience an increase in blood volume and red blood cell mass, according to the report of Goldberg et al. in "Therapeutic Benefits of Exercise Training for Hemodialysis Patients." Aquatic exercise has the potential to improve kidney function by lowering blood pressure and improving blood filtration through the kidneys, according to "Beneficial Effects of Water-Based Exercise in Patients with Chronic Kidney Disease," by Pechter et al. Aerobics is the recommended land-based exercise for kidney health, according to K.L. Johansen in "Exercise and Chronic Kidney Diease: Current Recommendations." However, resistance exercises also provide beneficial affects. If you are not used to exercising, start slowly and work up to 30 minutes of exercise three times each week, says the National Kidney Foundation. Individuals with kidney disease should engage in moderate physical activity to meet the U.S. Surgeon General's recommendation of 150 minutes of moderate-intensity exercise per week. Warm-up before you increase your exercise intensity. Five minutes of walking, cycling or light aerobics prepares your body for more strenuous aerobics or resistance training. After your workout is complete, cool down by walking and doing stretches to prevent soreness and fluid pooling in your extremities. Consult with your doctor before starting an exercise program to ensure that the activities are healthful and right for your current medical condition. Although exercises are beneficial for both healthy individuals and those with chronic kidney disease, your doctor will recommend the right level of activity for you.